❤Material: high quality 250gms paper, the glitter card felt like sandpaper and the glitter will almost never peel off. 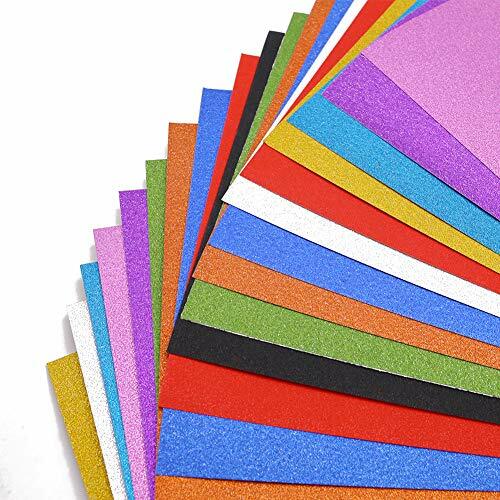 ❤Package includes: 2 pack sparkle cardstock paper, 10 sheets per pack, about 10 colors. ❤DIY Craft Paper: A4 size. Smooth sparkle on one side, non-adhesive white paper backing. ❤Easy to Use: These glitter papers are easy to cut and punch, suitable for Father\'s day cards, greeting cards, various decals etc. I love the colors and twinkle of this glitter paper! It works perfect in my cutting machine for adding some extra pizazz to my crafts.